Mike Schmitz takes a look at the strengths and weaknesses of Andre Drummond, with the help of UConn game-film and head coach Jim Calhoun. 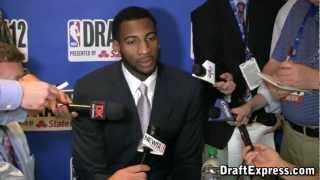 A video profile featuring elite 2012 high school big man Andre Drummond from the adidas Nations Experience in Los Angeles. Likely the player with the highest ceiling of anyone seen this weekend, Andre Drummond (#1 Scout, #1 Rivals, #1 ESPN) has elite NBA tools from a physical standpoint, possessing ideal size, length, bulk, mobility, coordination, and explosiveness for the center position, while also showing occasional flashes of skills to go along with it. This was an up and down two games for Drummond, as he showed moments of brilliance dispersed between long periods of complacency, something that is frustrating to see from a player capable of so much. From what we saw a year ago, Drummond has made strides in a few areas, the first of which is with his surprisingly deft passing ability, something uncharacteristic for a player his age with his physical profile. Drummond takes full advantage of his size in surveying the floor, showing excellent court vision from the low post, high post, and perimeter, frequently looking to pass to others before looking for his own shot. He had five assists between the two games here and a handful more nice passes, making bounce passes and chest passers to open cutters and shooters alike. While Drummond's passing ability is very unique and intriguing from a long-term perspective, it heavily plays into a major problem with his game: his lack of assertiveness in using his physical tools. Rarely will Drummond use his body to establish strong post position or call for the ball on the block, being much more content to run out to the perimeter and serve as a passing cog in his team's offense. When he does get the ball, he usually opts for weak finesse moves like turnaround jumpers and hook shots, neither of which he converts consistently. In the second half of his second game here, a close game his team lost in overtime, Drummond finally woke up and started getting physical, making it obvious how dominant he's capable of being when he puts his lower body into his opponent and calls for the ball, as no one at this level is able to stop him in such instances. Drummond's ridiculous lower and upper body strength combined with his size and explosiveness allow him to seal his man low and dunk over them with ease when he wants to, and the scary thing is he should be able to continue to do similar things against most college and many NBA opponents should he try to. The problem is he seems much more inclined to be a Vlade Divac-style passer/perimeter player than a Shaquille O'Neal-style low post bruiser. Defensively, one thing that became immediately apparent in watching Drummond play is how his awareness and positioning have improved in the past season, as he brings a good (albeit somewhat fleeting) level of attentiveness on this end of the floor. While he is prone to losing focus when plays draw on too long, he does a good job manning the paint and rotating to the help-side, while also showing flashes of elite level pick-and-roll defense, as his combination of size, mobility, and excellent hands make him a terror hedging and shutting down passing lanes, as he broke up and picked off a few pick-and-roll passes here. On the down side, he still can be out of control when closing out on the perimeter, while he likewise is prone to biting for pump fakes patrolling the lane. As a shot blocker, he is active contesting shots all over the lane, while showing good discipline in not roaming too far from the basket, often forcing the opposition to take high difficulty runners and floaters over his out-stretched hands. As a man-to-man post defender is where Drummond shows the most cause for concern on the defensive end, showing poor fundamentals and understanding of leverage, not getting great positioning and not asserting himself the way he's capable of. His physical tools here are obviously superb, and he has the potential to be an elite post defender in the NBA, though he has a very long ways to go. Rebounding is another area where Drummond isn't playing up to his potential, as he often isn't assertive in tracking down caroms, trying to pull in or tip balls with one hand rather than reaching up with both to secure, something he's very capable of doing consistently with his size, length, and hands. Looking forward, the sky is the limit for Drummond, and while it's easy to be harsh on him for not taking advantage of the things he's capable of, it's important to remember that he's still just 17 years old and he already is capable of doing many things at a very high level. While his demeanor hasn't improved much in the past year, he has shown a learning curve from a skills perspective, and there's still plenty of time for him to grow. With him already flashing abilities to excel in the passing game and in pick-and-roll defense, Drummond has the potential to be an extremely unique player down the road, as those things are rare from players with his physical profile, especially if he can complement those abilities with the dominating post game so many people are waiting for him to develop.